Houseplants: Houseplants can use extra TLC once the cold winter months are over. 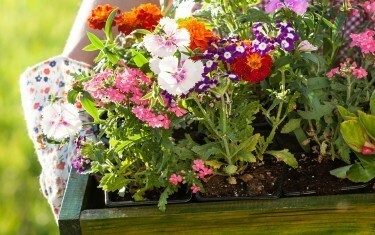 Help them out by adding fresh potting soil or replanting into a larger container if they’ve outgrown theirs. Add a coffee filter to keep soil from escaping the drainage hole and fertilizer to promote new growth. For a super boost, allow them to spend the spring outdoors in a shady spot (once temperatures are consistently above 50). They enjoy fresh air as much as you! Yard: You’re probably starting to see new growth as plants come out of hibernation. If you haven’t cut back perennial foliage from last year it’s time to get to it. Ornamental grasses especially. The more new growth appears the harder it becomes to cut old growth without cutting new as well. Amend Your Soil: Add Pine Soil Conditioner or Compost to help retain moisture and add organic matter to improve your soil. You can also use Worm Castings, quite possibly natures richest natural fertilizer, to stimulate plant growth and and fertilize naturally. Castings are great addition to potting soil too. Soil amendments will keep your plants happy all season long. Equipment: To save yourself time, get a head start on the spring season by inspecting your lawn care equipment. Sharpen the tools that need to be sharpened and fix the machines that need to be fixed. This way, you’ll have more much-needed time to relax in your garden. Research: Pull out your containers and start researching recipes. Picking out plants and planting your containers can be the highlight of the growing season. Pinterest is a great place to start for inspiration. Get some ideas and then stop in and speak to one of our greenhouse associates to discuss your options and get the best tips for long lasting, healthy container gardens. Maintenance: Set yourself up for gardening success by thinking through your pruning process. Cut plants back if their lower extremities aren’t getting enough exposure to sunlight. Snip spring flowering bulb stalks at ground level once their blossoms start to die. Wait for leaves to wilt on their own before cutting them off. Bulbs like daffodils and hyacinths bulb will spend their energy generating blooms for next year. Weeding: Show weeds no mercy by attacking them before they can attack your garden. Once they have seeded and multiplied, weeds can take over your landscape beds, infesting quickly. Use Roundup® Ready-To-Use Weed & Grass Killer to eliminate existing weeds and apply Hi-Yield Turf & Ornamental Weed & Grass Stopper to landscape beds prior to mulching for long lasting control. Night Frosts: Protect delicate flowers and new shoots from unexpected night frosts. Vulnerable bedding shouldn’t be planted until the end of the month. Pay attention to the weather forecast in case your tender plants need additional cover to get through cooler nights. Mulch: Like us, plants need all the water they can get over the summer. Replace old mulch with a new, thin layer in areas where you currently have greenery and intend to plant later. Now plants like shrubs and perennials will stay hydrated as the temperature rises. Trellis: Trellises add romantic flair to a basic backyard. Buy a classic, pot or wall trellis now so that climbing flowers have time to grow, adding vertical dimension to the view of your yard.